The colour green was characteristic of the rebel flags of ’98. 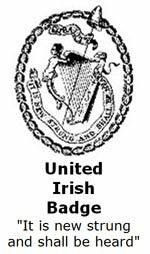 Green flags bearing yellow or golden representations of the uncrowned harp were carried by the rebels in Wexford, Wicklow and in other counties also. When the insurgents entered Wexford town on the 30th May 1798, they came with green banners flying. They later hoisted a green flag above the barracks on the quayside. Because of the shortage of green flags used by rebel corps, it was customary to display banners of all colours except orange which was supposedly disliked by the people. According to Edward Hay who was in Wexford at the time, many female sympathisers offered coloured petticoats which were used as flags and were usually ‘decorated according to their fancy’. Many of these women began working on embroidered flags, some of which remained unfinished when the rebellion had been put down. The last battle in Wexford was fought under a green flag which flew from the ruined windmill on Vinegar Hill overlooking Enniscorthy town on 21st June 1798. The meaning of the letters MWS is uncertain. Loyalists believed that they meant “Murder Without Sin” i.e. that rebels could murder Protestants with impunity. Other commentators have suggested that the real meaning is “Marksmen West Shelmalier”. Flags used in Battle were of a large size and it would take great strength to keep them constantly raised. Both sides used these large flags to act as a rallying point for member’s of the Battalions and Regiments. In the Crown forces, a regimental flag was usually held by the youngest officer, who was guarded by a soldier with the rank of Colour Sergeant. It was a mark of dishonour for a Regiment to lose its flag, and battles were often marked by furious struggles for the their possession. On your visit you will meet the key figures of the Rebellion, participate in our state of the art 4D battle of Vinegar Hill Experience, discover how weapons from the period worked and learn in gruesome detail how some 20,000 insurgents faced the might of 10,000 well-trained and well-armed Crown Forces. Contact Address and numbers: The National 1798 Rebellion Centre can be contacted at 053-9237596. During the winter months (October to March) bookings for the 1798 Centre can be made by contacting Enniscorthy Castle at 053-9234699.